ORIGINAL MOTION PICTURE SOUNDTRACK SCORE COMPOSED BY BENJAMIN WALLFISCH! 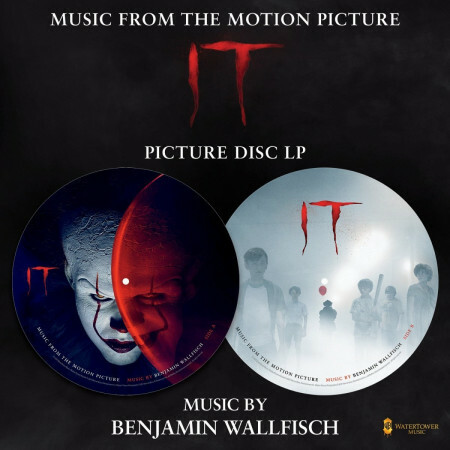 Limited Edition Picture Disc: New Line Cinema's horror thriller "IT," directed by Andrés Muschieg ("Mama"), is based on the hugely popular Stephen King novel of the same name, which has been terrifying readers for decades. When children begin to disappear in the town of Derry, Maine, a group of young kids are faced with their biggest fears when they square off against an evil clown named Pennywise, whose history of murder and violence dates back for centuries. Golden Globe® and Emmy® nominee Benjamin Wallfisch is recognized as one of the leading film composers of his generation, with a career spanning over a decade and 60 feature films. He has composed music for such legendary film makers as Steven Spielberg, Rupert Wyatt, Gore Verbinksi and Lars von Trier, and has worked on scores that have been recognized with awards and nominations at the Academy Awards®, BAFTAs® and World Soundtrack Awards.